The six elements mentioned above make for a very enjoyable read and those who love seeing these topics penned in any Kate Morton novel, will enjoy this offering by fellow Australian author Luke Devenish. 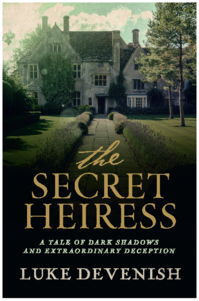 The Secret Heiress is a deeply layered mystery set in central Victoria in two time frames with two main characters, Ida in 1880s and Biddy in the 1900s. The mystery kept me guessing and the complex layers of lies and deceit were difficult to unravel, making for a satisfying read in a 'whodunnit/whydunnit' kind of way. I highly enjoyed the upstairs/downstairs environment, and I think this is the first gothic historical fiction novel I've read set entirely in Victoria. My only complaint would be the lack of chapter breaks. There were very clear breaks between time periods, however these sections were quite long with no chapters to break up the pages. (There were a few sentence breaks but I always like to stop reading at the end of a chapter and I wasn't able to do that here). Luke Devenish is an accomplished writer and this was an impressive and refreshing read in a genre generally dominated by female authors. Recommended for historical fiction fans far and wide; particularly those who haven't read a gothic Australian novel before.